While the global economy continues to sag, it is a source of strength for the U.S. stock market, according to a recent Bloomberg report that shows a segment of American companies with major exposure to Europe is up about 23% on the year. If the European softness hasn’t been adequately priced, it represents a future reckoning for U.S. investors. 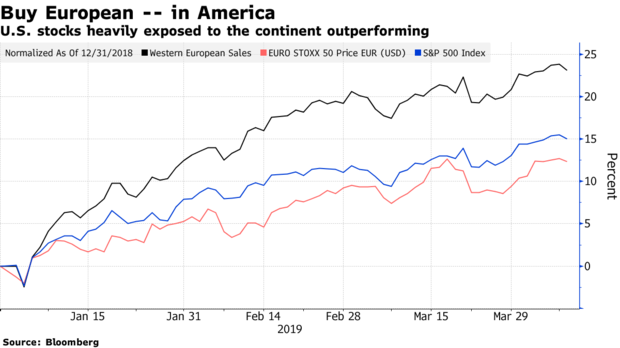 The S&P 500 is up about 15% in 2019 while European equities have seen about a 12% gain in dollar terms. The situation is a transatlantic conundrum: the International Monetary Fund blames the continent for its softest global growth outlook since the financial crisis, while the Trump administration is readying tariffs on $11 billion in imports from the European Union. If the European softness hasn’t been adequately priced, it represents a future reckoning for U.S. investors. During the fourth-quarter risk rout, euro-tilted U.S. stocks lagged behind the S&P 500 by about 4.5 percentage points. The median stock in this Goldman Sachs Group Inc.’s list of 50 companies from the Russell 1000 generates roughly one-third of its revenues from the continent and 60 percent from outside the U.S.
Midway through Tuesday’s session, this basket is modestly trailing the S&P 500. Heading into the year, Bloomberg Intelligence chief equity strategist Gina Martin Adams warned that Europe, not China, posed the bigger threat to S&P 500 earnings. Disclosed sales to Europe among index constituents dwarf those of China, she noted. The torrid run of form year-to-date reinforces the risk that meager activity in Europe — should green shoots fail to bloom — and heightened trade tensions are under-priced in American stocks. Certainly, the German bond market does not suggest a high degree of underlying domestic vigor.